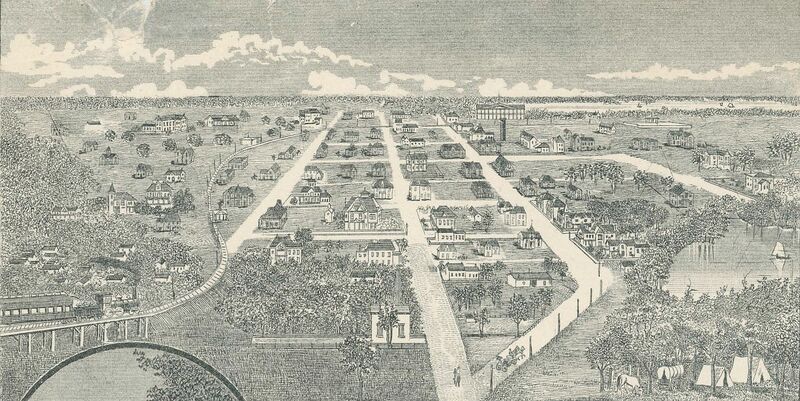 This beautiful suburb of Dallas is situated on the south side of the river, on a chain of hills from 200 to 250 feet above and overlooking the city, and about three-fourths of a mile from the MERCHANTS’ EXCHANGE, being from any part of it within ten to twenty minutes’ walk from the business center, or eight to fifteen minutes’ drive, or five to ten minutes’ ride by the suburban cars, which run all the time from the court house, from 6 o’clock in the morning to 11 o’clock at night. Fare, five cents. Oak Cliff has a first-class water works system, furnishing clear, pure spring water; good schools; broad, macadamized avenues and streets; lovely lakes and parks (from the pavilion, surrounding towns can be seen). Owing to its great altitude and topographical formation, perfect drainage is insured, and it is unexcelled in the Southwest as a healthful and picturesque residence site and educational center. Its superior accessibility to business, makes it the most desirable portion of the city to live in for the citizen of Dallas, whether he be poor, rich or of moderate means. Images taken from a promotional broadside, which may be seen in full in a downloadable PDF here, from the collection of Texas Promotional Materials held by the DeGolyer Library, Central University Libraries, Southern Methodist University. This drawing is similar to another Oak Cliff promotional piece (also from SMU’s vast collections) which I wrote about in the post “Thomas Marsalis’ Spectacular Oak Cliff Hotel: 1890-1945,” here. Top image is much larger when clicked.